Sunset crept up on me, its deep red rays flung brazenly across the sky – but I was too mesmerised to take it all in. Sitting just a few metres away, staring straight at me but completely unbothered by my presence, was a juvenile male lion. 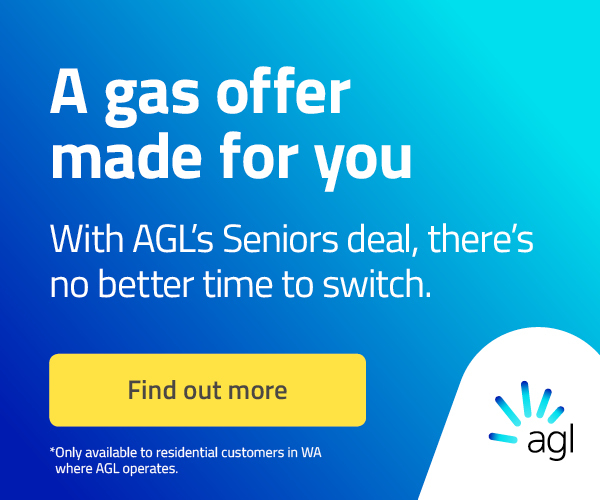 Ten metres beyond his brother sprawled languidly. And between them lay the fresh carcass of a zebra they had recently hunted and killed. Now, having eaten their fill, they were both satiated. That’s when I noted two jackals skulking nearby, no doubt concocting some devious way of taking their share of the zebra too. But a jackal is no match for a lion, and this pair had learned to be patient and wait for their chance to move in. 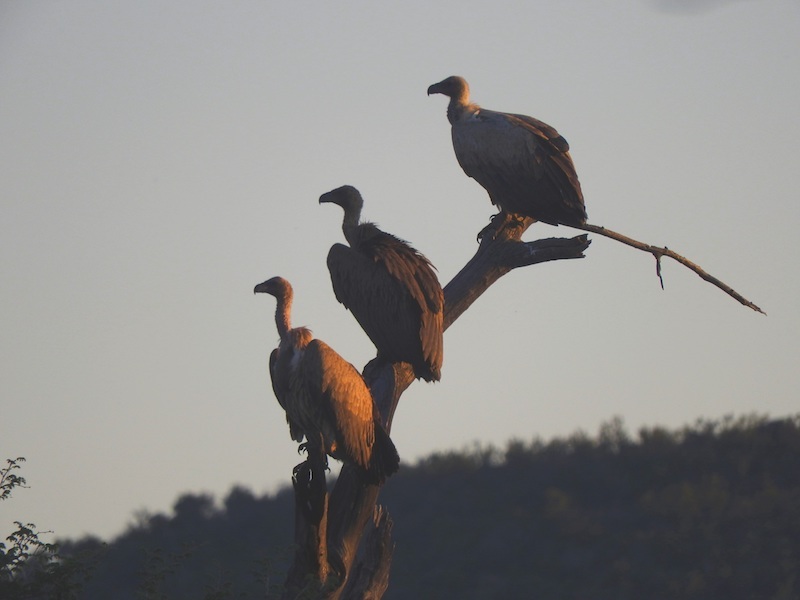 We were in the wild, somewhere within Madikwe Game Reserve in South Africa, on the border with Botswana, all sense of time and location suspended as nature held sway. Then, in a moment of pure magic, the nearest lion yawned, his gaping mouth offering a glimpse of the canines that had so easily ripped the zebra apart. It was an experience I never dreamed I could be part of, yet here I was up close and personal with the king of beasts. And this was just our first outing after arriving at the reserve mid-afternoon. I’d already seen water buffalo, Nile crocodile, impala, springbok, wildebeests and giraffes since setting off from our lodge. But nothing prepared me for the joy of being amid lions in the wild. The journey back was interrupted by a stop in the dark – we were to be treated to cocktails under the stars, and what a show it was. Under a perfectly clear sky, I revelled in the amazing light show of planets, stars, galaxies and even meteors burning up as they entered Earth’s atmosphere. It was a magnificent way to end the first of our safaris: sipping G&Ts, talking excitedly about the night’s sightings, all beneath the blanket of that overwhelming night sky. Mind still spinning, it was nonetheless early to bed; we had a 6am call for our second safari, with a promise it was going to be very special. At 7am, after hot drinks and pastries, we were rugged up and climbing into the converted Land Rover to take part in a rhinoceros conservation project. 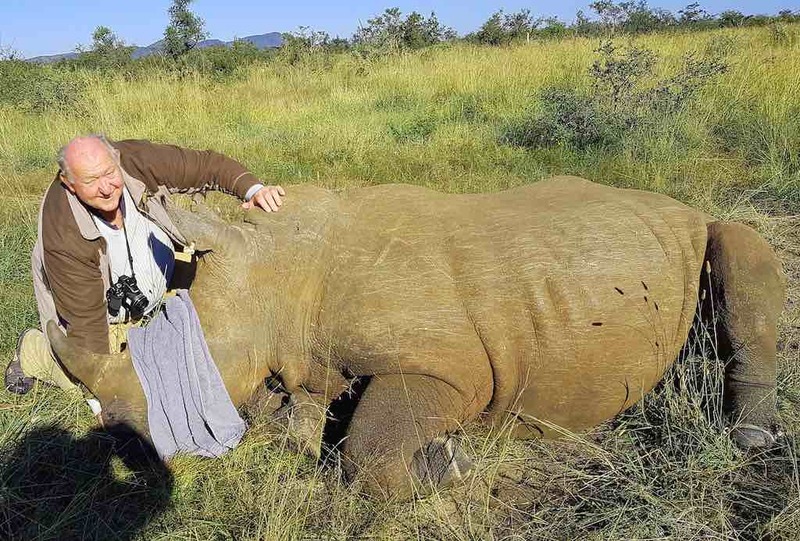 Unfortunately, poachers still kill rhinos for their horns, which are said to contain aphrodisiacs. This conservation project, which is voluntarily run by professional wildlife guides based at Madikwe, is needed to identify individual rhinos; to take samples of horn and blood for DNA purposes; and to microchip the beasts so they can be better identified even years later. It is an expensive exercise because it involves helicopters, vets and various assistants as well as the volunteers. For security reasons I can’t give too many details or identify any of the team. The poachers are sophisticated and in the past have been known to hunt down significant human participants with dire consequences. Today’s target was a female about three years old and, despite her youth, she weighed about 1.4 tonnes. The rhino was drugged by a dart fired from the chopper, which weaved precariously in a series of stomach-churning tight turns, following her until she went to sleep. She was treated as gently and as quickly as possible. My job was to put my hand in her mouth to confirm she was breathing. This was an unreal experience and it’s impossible to describe the feelings of getting up so close and personal to a living rhinoceros. Being a herbivore, there were none of those sharp lion-like teeth inside her mouth, just warmth and slight moisture. I really liked this cute girl. I noticed that her hooves were quite dainty and noted the scratch marks on her skin from the thorny bushes she pushes past. We were invited to name her, so we called her Priscilla, which seemed rather apt as she was a pretty young thing. Our work done, Priscilla was revived as soon as possible and she very quickly disappeared back into the scrub. We bid our farewells to the team and headed back to the lodge. It had been a most exciting and wonderful morning, and the memories of that experience will be etched in my mind forever. 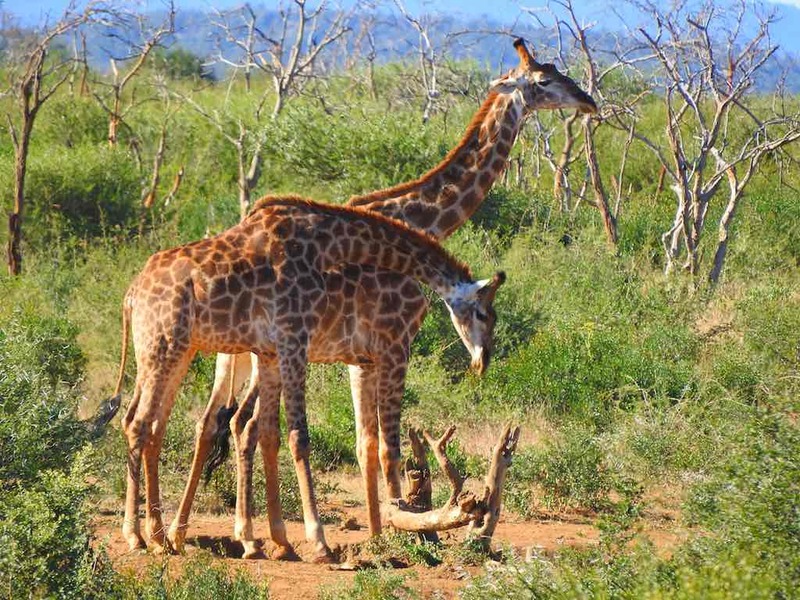 Madikwe Game Reserve covers 75,000 hectares and contains 33 lodges. I stayed in Jaci’s Lodge for three nights and loved every minute of it. Located next to a river and built on stilts to survive any flooding, it felt like living in a treehouse. My room was spacious and very comfortable, being quite private as the rooms are well away from each other. Monkeys played on my balcony and antelope wandered between the stilts beneath my room. There is a large, common area consisting of dining room and lounge area with a bar. An outdoor fire pit leads off the dining room, while there’s another comfortable lounge in a separate space closer to the river. All meals are included in the tariff, and the food was excellent. 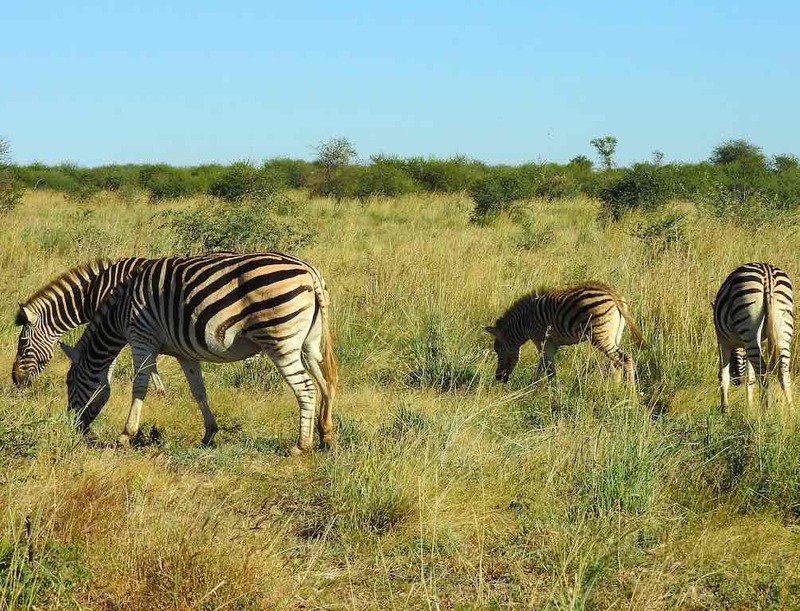 Safaris are conducted in the early morning and late afternoon, when the animals are most active. Armand, the wildlife guide, and his young trainee Zander, who was lookout, were both extremely knowledgeable, and their vivid descriptions of animal behaviour gave me a greater appreciation of the region and the interactions of the animals. 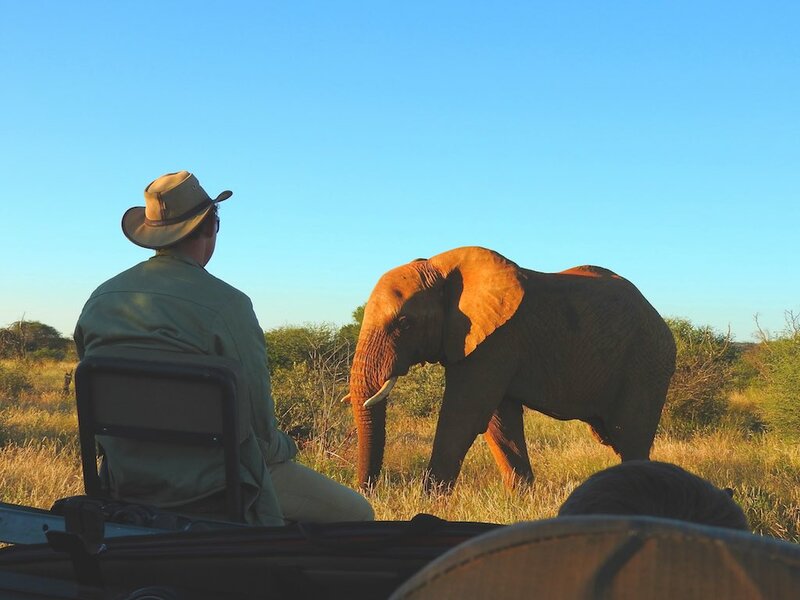 The guides from all lodges are in constant radio contact with each other, passing on details of the animals’ location – a major reason the animal viewing on all the safaris was so good. 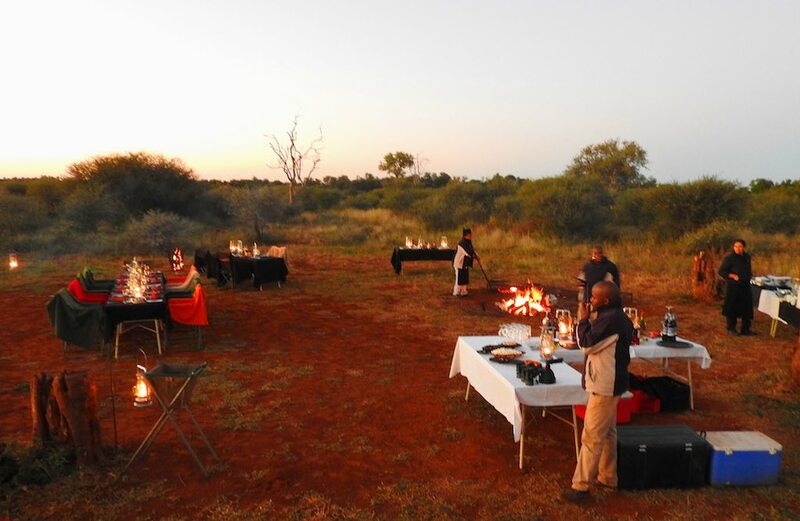 On our last night the staff surprised us by organising a braai (barbecue) out on the veldt. A long dining table and chairs were set up and the food was cooked either in coals or over a fire. Drinks flowed and we had the best time recounting our adventures and picking up tips from the guides. So many of the experiences were truly awe-inspiring, and some of my encounters were thrilling. A large male baboon successfully stopped us proceeding up his road where his family was gathered. A hyena popped out of the bushes quite close to me and sped away, but not before I got a photo. Various types of antelope were seen everywhere. I witnessed warthogs wallowing in mud. Zebras were abundant. I had very close encounters with elephants, including one bull who got a bit angry, so we wisely got out of his way. I was fortunate to get close to wild dogs, which are very rare, but as they were resting, they weren’t too fussed about the tourists gawking at them. Mother rhinos with their calves were especially endearing, particularly after my experience with Priscilla. My favourites were the giraffes, and I saw lots of them. They are the most elegant of beasts as they lope along with giant strides. I’ll never forget one that was cleaning its ear on a twig high up a tree, and it looked to be in seventh heaven. The visit was over but the adventure continued even on the flight out of Madikwe. The game reserve is so large it has two airstrips, so we boarded the ten-seater Cessna at the main strip and flew to the other one to pick up two passengers. As we approached the strip to land, a herd of zebra was on the runway and most moved away at the sound of the plane. But one large zebra stallion stood its ground and claimed ownership. The solution – we flew very fast and very low above it; the stallion got the message and quickly headed into the bush. We picked up our passengers and as we took off I looked down to see a large waterhole below that was filled with elephants and hippopotami. How could travelling ever get better than this? Steve Collins travelled as a guest of South African Tourism.